Cascade Wallet comes packaged in a small Plexiglas box, almost like capturing and freezing the mystery in ice. The flap door of the Plexiglas holds tight the magic with tiny magnets. 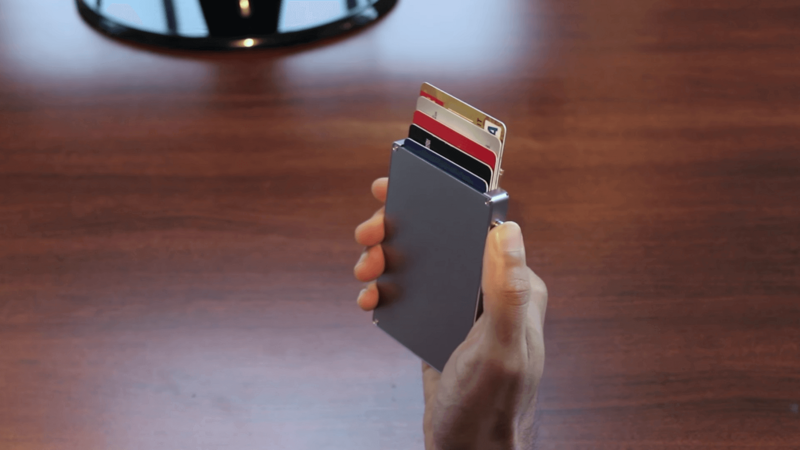 Cascade Wallet is made out of anodized aluminum and it is pleasantly light. The aesthetic embodies the minimalism. The top door opens easily with a little pressure and the push button mechanism results in the cascading of the cards evenly. This is a Gadget out of a James Bond Film! And will definitely intrigue collectors and hobbyist. The money clip keeps bills, receipts firmly clipped. Cascade Wallet add-on, Leather Cover easily connects with the ports and wraps to enclose the cascade wallet and stays firmly strapped with a Velcro. This premium leather provides expandability to carry more while maintaining the slim and sleek form factor. The Cascade Wallet by Mani Wonders is not only a minimalist and slim wallet, but a nice eye-catcher especially when paying for things. This creates an effect called Vorführeffekt, where the behavior of individuals is impacted by observation of the action of others and their consequences. The Cascade Wallet is available in Gunmetal with Chrome Trim, Silver with Black Trim, Gold with Rose-Gold Trim and All-Black with Black Trim. In addition, the leather cover is available in Brown, Navy and Black. Leather cover is hand stitched and comes packaged in a plastic compact box. If you are a card collector like me, then the leather cover would definitely be useful in storing additional cards, bills, cash, receipts, coins and more. Never has money clip look so beautiful, especially with this one-of-a-kind built-in spring loaded mechanical design. To sum it up, the cascade wallet is a RFID secure, sleek and smart wallet for the modern ‘Tap and Go’ Generation.